Me and My SoldierMan: Delurker Yourself! I totally forgot today was International Delurker Day!! Gah! I meant to schedule this post days in advance and here it just snuck up on me. Slacker me. For those of you who don't know, a "lurker" is a regular (or semi-regular) blog reader who comes, reads, and leaves without leaving a comment. Come on, we all do it. I do it, too, so no fear. There's no judgement here. So, today, if you don't often comment here, if you've never commented here or if you're a brand-new follower, just drop a note and say hi! No pressure to write anything profound or insightful. Just a friendly "Hey, y'all!" And please, for the sake of all that is good in the world, have your reply-to email set. If you don't know what I'm talking about, see the link at the top of my page. Every time you enable your reply-to address, an angel gets his wings. Also, notice my sweet new blog header up there? Courtesy of Dirt and Lace Designs, yet again. I'm telling you, this girl is fabulous. Her button is in the right-hand column. Go, click and be amazed. Haha I'm a lurker too. Definitely not a new follower, just haven't taken the time to comment before (as far as i can remember). I'm a lurker...I think I've commented once or twice. I do read and enjoy your posts:) Now I need to go announce this on my blog! My name is Britt Dill and I am a lurker! :) I usually stop by and read, but I usually don't comment, still love reading it though! I love this idea, I may have to put it on my bloggy blog. Definitely not a lurker, but I love this day already! And partially because of the temps out here in SoCal, but to drag out the lurkers is awesome!!! Not a lurker! Just wanted to say thanks for this post because I had no clue when Delurker Day was. I am going to post about it now! BTW, I love your new header. Too cute! although I comment from time to time, i still consider myself a lurker on most of the blogs i follow, because I just dont have the time to read AND respond to every one of them...lol. but, i DO read the majority of them, and enjoy your posts very much!! Haha "A SOONER in Texas" LOVE IT!!! kind of a lurker, I may have commented a few times here and there. :) Love the delurker day idea! I lurk...I read from Google Reader and I'm too lazy to click over. Haha. We have SO much in common...I need to email you back. I'm too mouthy to be a real lurker, but just wanted to say "hey y'all!" New follower here :) Just stopping by to say hi and can't wait to read more! I'm deff a lurker, but I try to leave comments too when I think of something good to say! I'm LOVING the addition to your blog header! Represent!! Thank you so much for your post on setting up the reply-to address! I didn't know about it until I read your page. Have a wonderful weekend! I'm not a lurker but I thought I'd say hi! Looks like you got a pretty good response from that! 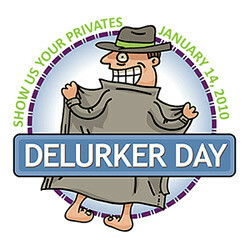 I'd be curious to see if I have any of those...probably not :) But now it's not Delurker Day anymore! Dang it. some days, you just have to lurk!!! I love the Sooner thing at the top of your blog! :) So cute, I think I have commented before, so hi anyways!